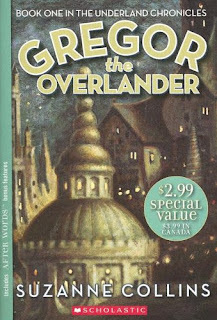 Goodreads Summary: When eleven-year-old Gregor follows his little sister through a grate in the laundry room of their New York apartment, he hurtles into the dark Underland beneath the city. There, humans live uneasily beside giant spiders, bats, cockroaches, and rats—but the fragile peace is about to fall apart. Gregor wants no part of a conflict between these creepy creatures. He just wants to find his way home. But when he discovers that a strange prophecy foretells a role for him in the Underland's uncertain future, he realizes it might be the only way to solve the biggest mystery of his life. Little does he know his quest will change him and the Underland forever. Rich in suspense and brimming with adventure, Suzanne Collin's debut marked a thrilling new talent, and introduced a character no young reader will ever forget. My Take: After reading The Hunger Games I decided I wanted to read Suzanne Collins' series Underland Chronicles. I liked the book but it is more for a young reader (but a really fun read). I thought I would like it because of my obsession of the Harry Potter Box Set. I will probably read the remaining books of this series but they are not on the top of my list to read.